Demand for lithium—the hottest commodity on the planet and the only commodity to show positive price movement in 2015—is poised to continue on its upward trajectory, becoming the world's new gasoline and earning the moniker of "White Petroleum". And the battle for market share in and around this commodity has everyone from major tech players to trend-setting investor gurus vying for a foothold. Driven by the rise of battery gigafactories and game-changing Powerwall and energy storage businesses, the world now finds itself at the beginning of a lithium super cycle that is all about securing new supply, much of which is poised to come from lithium superstar Argentina. We have Tesla in the far corner, building its battery gigafactory in Nevada, for which it needs tons of lithium at a reasonable price, and just last week Tesla announced its plans for the Model 3, which has already hit over 300,000 pre-orders. To give you an idea of just how meaningful this is, Tesla produced less than 50,000 cars last year. Elon himself mentioned during the unveiling that Tesla will be gobbling up much of the world's lithium supply with plans to produce 500,000 EVs per year. "In order to produce a half million cars per year…we would basically need to absorb the entire world's lithium-ion production." Remember – this is one man, one company. Tesla's soon-to-be-completed gigafactory will produce more lithium-ion batteries than the rest of the world combined. And opposite Tesla, we have some other major players shifting gears that will affect the lithium space. Chinese billionaire Jia Yueting is stepping onto Tesla's playing field with its own electric car start-up, Faraday Future, and Apple is planning one too, by 2019. Through its Alphabet holding company, Google is also getting into the game with plans for a self-driving car. They are fighting it out not only to be the first to capture the most electric vehicle market share and the best engineers, but they are getting down to the core of this arena, which is lithium—the key element that will make it all work. This is D-Day for lithium miners, and it's all about new entrants to a space that is about to change exponentially. Big investors are definitively standing up and taking notice—and even jumping into the game. One of Canada's most noteworthy investors in the mining sector, Frank Giustra, is the latest to see lithium for what it is—the single-most valuable commodity of our tech-driven future, and one that is already in short supply. The investor extraordinaire with a focus on big mining deals has thrown his support behind Lithium X which is exploring in the key "Lithium Triangle" area of Argentina and is the largest land holder in Nevada's Clayton Valley, the only producing lithium area in the entire United States. Lithium X has over 15,000 acres in Clayton Valley, near Albermarle's Silver Peak mine, the only American lithium producer right now, and about three hours from Tesla's gigafactory. "Right now, there is a lot of 'smart money' getting in on the lithium land rush, and a mining legend like Giustra would never have been late to this party in Nevada—but the big attraction is our lithium plays in Argentina, which is ground zero for the commodity in South America," Lithium X Chairman Paul Matysek told Oilprice.com. "At the end of the day, Frank, likes to get involved in a project if he sees a massive shift in an industry's fundamentals," Matysek added. 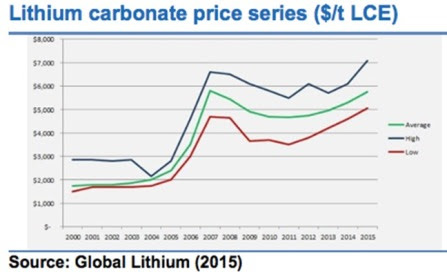 "Lithium— is certainly showing all the right signs!" The fundamentals here are impressive, and the catalysts for lithium prices are spectacularly clear—all of which is pushing prices up and creating an aggressively competitive playing field that is likely to see a lot of acquisition talk. There are plenty of reasons to be bullish about what Goldman Sachs calls the "new gasoline" that will fuel our technology-driven resource era. According to The Economist, the ''global scramble to secure supplies of lithium by the world's largest battery producers, and by end-users such as carmakers", among other things, has seen the price of lithium carbonate imported to China more than double just in November and December of last year alone, when it reached an amazing $13,000 per ton. Some contracts in China, according to Bloomberg, have seen over $23,000. There is no denying that this is a euphorically tight market, with demand rising steadily and expected to spike drastically, and suppliers struggling to keep pace—which means that the door for new lithium supplies is wide open and this is now a fast-paced exploration and exploitation game. And even without the battery gigafactories, a Powerwall and storage revolution or streets lined with electric vehicles—demand for lithium would still remain steady just to keep up with consumer electronics. For the electric vehicle industry alone, Goldman Sachs predicts that for every 1 percent rise in EV market share, lithium demand will rise by 70,000 tons per year. Furthermore, Goldman Sachs predicts that the lithium market could triple in size by 2025 just on the back of electric vehicles. The lithium that is currently being mined quite simply is not enough to put a dent in the projected demand dictated by our hunger for consumer electronics and the pending energy revolution. This means that the new market is all about new players. Right now, most of the world's lithium comes from Australia, China and the "Lithium Triangle" of Argentina, Chile and Bolivia. In North America, Nevada is the only player in this game, but more to the point, the U.S. state has the best lithium there is to have—lithium found in the brine. Lithium sourced from brines, or salt water, is the most cost-effective on the market, and sourcing enough of it right at home would be a coup for all sides in the battery, storage and EV game. And while lithium has traditionally been controlled by a handful of major global suppliers, spiking demand is changing this landscape drastically. The four companies that currently control the lithium space—Albermarle (NYSE:ALB) in Chile and Nevada; SQM (NYSE:SQM) in Chile; FMC (NYSE:FMC) in Argentina; and Sichuan Tianqi in China—are about to make way for the new entrants. And when it comes to new entrants, the biggest market share will be scooped up by those who can come up with the most lithium sourced from the brine. That means getting in on the new game in Nevada, but perhaps more importantly, securing positions in the bigger venues, particularly in Argentina. Within the Lithium Triangle, it's all about Argentina right now. Chile is not granting any new concessions, and opposition in Bolivia has led to a suspension of lithium mining. Argentina has recently announced a deal with creditors to repay debt stemming from the country's 2001-2002 default, paving the way for Argentina's return to global financial markets. And the Argentina lithium rush is already in full swing, with miners eyeing resources of up to 128 million tons of lithium carbonate. Investors have been pouring into this sector, according to Argentine Mining Secretary Jorge Mayoral, who recently noted that "all the big auto makers have been present in Argentina trying to get a foot in lithium development", including Toyota, Mitsubishi and Posco. For those who come up with the next supply, the industry will come right to them, and the sniffing around has already begun in full force.